Also known as the Indian Tiger, the Bengal Tiger is the most common of all tigers and is a cultural icon. The Bengal Tiger is the national animal of India and Bangladesh, and can even be seen on Bangladeshi money! Bengal Tiger stripes are unique to each individual and act just like human fingerprints do. At approximately 4 inches long, the Bengal Tiger has the largest canine teeth of any living cat, and their retractable claws are perfect for climbing trees! Bengal Tigers present in India are mainly found in subtropical and temperate upland forests. In Bangladesh, they can be seen living in the Sundarbans mangrove region where they are known to swim between islands. Bengal Tigers are the only tigers known to thrive in a mangrove habitat! Prime lowland forest is their favourite habitat within Nepal, and in Bhutan they live in the subtropical Himalayan foothills and in north temperate forests. How and what do Bengal Tigers eat? These powerful hunters are most active at dusk and dawn, when they use tall grass and trees to stalk prey and silently attack. After capture, the Bengal Tiger drags or swims with prey to a protected area to consume. Common Bengal Tiger prey includes water buffalo, deer species, gaur and wild boar. They are capable of eating up to 40kg in one sitting but don’t do this very often! Are Bengal Tigers solitary like most tigers? Yes. Bengal Tigers are solitary and spend most of their day resting in a shaded area, conserving energy for their late hunts! Bengal Tigers maintain home ranges, and females choose areas that they think are suitable for raising young. This often includes a nearby water source, so that the cubs can cool down on hotter days. Much like the Sumatran Tiger, the Bengal Tiger breeds all year round and cubs learn necessary hunting skills at 6 months of age. When they reach 2-3 years, it is time for them to leave their mother and shortly after their departure she will return into heat and begin the breeding process again. Bengal Tigers are famous for their rival-attacking abilities, and have been known to target nearby predators such as leopards and wolves when prey is scarce. What threats face the Bengal Tiger? The main threats facing the Bengal Tiger are poaching and habitat loss. 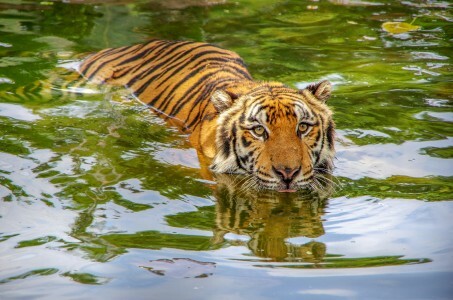 Those tigers living within the mangrove area are also sensitive to climate change as sea levels rise and alter the structure of mangrove systems. Wildlife crime is high and well organised poaching gangs exist to continue the illegal trade between India, Nepal and China. Bengal Tiger body parts and bones are of high value, and even in protected areas it is difficult to halt illegal activity in the pursuit of these items. Conflict with humans is also high for Bengal Tigers living in close proximity to towns and settlements. In areas where both tigers and humans thrive, sightings of Bengal Tigers are frequent and create fear within communities. Myths and stories of ‘man-eating’ Bengal Tigers fuel the act of hunting, and farmers often use poison as to avoid prosecution for shooting. As increasing human populations spread throughout Bengal Tiger territory, these conflicts will continue to occur. What can we do to help Bengal Tigers? In India and Nepal there are 11 main protected areas existing to protect prime Bengal Tiger habitat. The Tiger Project, established in the 1970’s, has helped stabilise Bengal Tiger populations in these reserve areas although overall populations are still decreasing. The Wildlife Protection Society of India watches over any poaching activity, carrying out confiscations at borders. Although they are able to confiscate and prosecute poachers, locating the operations source is very difficult and origins remain unclear. In order to target entire gangs, they are working to improve this method. In 2012, WWF created a global campaign called ‘Save Tigers Now’ which works against Bengal Tiger threats and aims to increase the population by 2022. They actively promote a ban on public contact with tigers in the U.S. as it promotes unnecessary breeding, and encourage consumers to stop buying wildlife products when travelling abroad. For more information or to donate, check out their website here.